Late post than never. The most affordable dual core smartphone has been released for some time, and the information on the internet must go on. 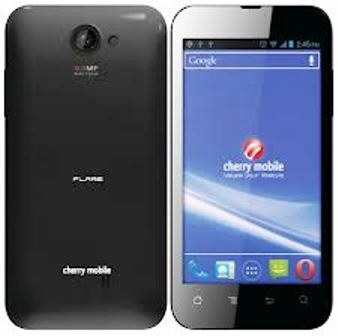 Since, Cherry Mobile Flare has been reviewed many times in different blogs, I would not go as much as getting a review. So, lets just share full specification, features, and price of Cherry Mobile Flare. Everyone knows CM Flare is a dual core smartphone and 5.0 inch wide IPS display.The question is, what is IPS display? And how will this affect on users end? IPS display can render clear images and real time response time, moreover with IPS watching videos and playing games in any angle would still give clear and crisp graphics, and it doesn't lighten or show tailing when touched. 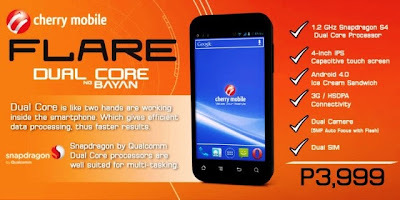 One more controversial issue of Cherry Mobile Flare is the battery, as the official specs state that it is 1600mAh, while in reality its just 1500mAh, anyway lets not stress ourselves for that 100mAh. For full specs and price, read below. What's in the Box of Cherry Mobile Flare?